even when the immediate event that brings about the new discovery often seems to be a chance thing, it would not have been possible without a prehistory that is far from accidental. the most important uses of a discovery or invention are often outside the area where the discovery was made. The star of this story, the nickel-titanium alloy Nitinol, was investigated with the aim to find heat and corrosion resistant materials (Nitinol, the acronym for the alloy, comes from the designations for nickel, titanium and the Naval Ordnance Laboratory). The immediate incident that brought about the discovery may be said to be the occasion when the Deputy Director of NOL, Dr. David Muzzey, at a working group meeting placed a twisted piece of nitinol wire on the hot bowl of his pipe, whereupon the wire suddenly and with unexpected force straightened out. This behaviour didn’t however come as a total surprise to the discoverer of nitinol, William Buehler, who had been working with the alloy for some time. There were already several earlier indications that something extraordinary took place in this material. As one unusual circumstance may be mentioned that a nitinol rod on being hit at higher temperatures answers with a pure long-lasting ringing sound, whereas at room temperature the reaction is a short dead clunking sound such as when a lead object is hit. 1. The plastic deformation process in these alloys in their low temperature phase (irreversible at this temperature) differs basically from that in the majority of other metals and alloys. Whereas in the latter group the process is tied to the emergence and movement of certain defects (dislocations) then the deformation in nitinol occurs by changes in the regular crystal structure of the alloy. In the low-temperature phase of nitinol the crystal cells may be imagined as tilted at one or the other angle. The change in shape of the piece of metal as an entity is then caused simply by a change in the relative numbers of crystal cells tilted at the respective angles. 2. On heating of shape memory alloys, at a relatively moderate temperature a phase transition occurs, and the crystal cells become cubic. With this all information of how they were positioned recently at the lower temperature is lost and the original state is recovered. The temperature at which this phase change occurs can be regulated in nitinol within a range of some hundred degrees by varying the Ni/Ti proportions. How can a detail made of nitinol be made to ”remember” the desired shape? To manage this it is annealed for some time fixed in that shape at a comparatively high temperature (500 … 600 °C ). 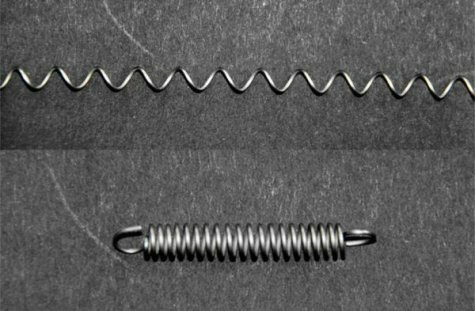 As a result all internal stresses that resulted from forcing it into the desired shape disappear, such as the stresses from winding a straight wire around a cylinder to make a coiled spring. After cooling and release from the retaining fixture we have produced for instance a spring coil with the desired shape. Of course a material with such unusual properties has found many uses, maybe not on a very large scale, but in very varying areas: in details that take on the required shape on reaching the working temperature, stents used in medicine to widen blood vessels, thermal sensors-actuators that react on temperature changes. In its high-temperature cubic (austenitic) phase nitinol has one more exceptional property – it doesn’t obey Hooke’s law. Hooke’s law states that the deformation of an elastic body (for instance the elongation of a rod that is pulled) is proportional to the causing force. With nitinol the force may be constant within large limits of the elastic (reversible) deformation. Such materials are called superelastic and they have been usefully employed in stomatology but also elsewhere (elastic spectacle frames, collapsible aerials for cell phones). But even in our quite everyday life there is a material carrying a memory of its own shape although we don’t utilise this memory. Everyone can prove it for themselves: take an empty yoghurt container and put it in the oven (better wash the container first!). At 140°C the cup will change into a flat disk shape within some ten minutes. The piece of material had just this shape before the cup was made. Such polymers – thermoplastic elastomers– are in a rubber-like stretchable state at higher temperatures and can then easily be formed into the desired shape by stamp moulding. After cooling – in the stretched shape – the given shape will be retained, until we by heating it again give the material the internal freedom to regain its former shape, the memory of which it has kept all the time. The microscopic explanation is the temperature dependence of the mobility of the polymer molecular chains. More detailed information is provided in the “World of Materials” article “Kujumäluga sulamid (Shape memory alloys)”, where also some video clips demonstrating the behaviour of nitinol are shown. Photo 1. It is no surprise that the lower shape can be stretched out irreversibly to the shape shown above it. 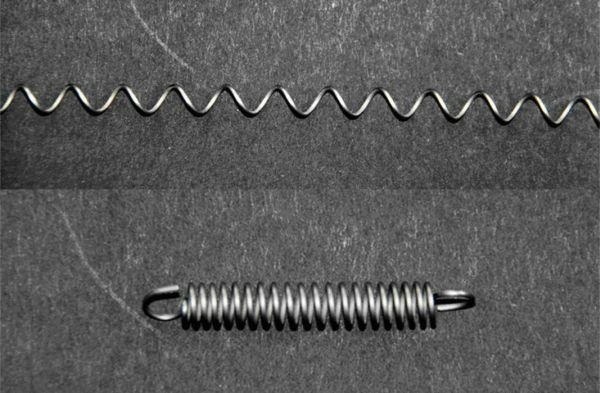 But here the upper photo was made before the lower – the original shape of the straightened (plastically deformed) nitinol spring returns on heating at 45°C. Photo 2. Shape memory is also characteristic of thermoplastic elastomers used e.g. for food containers. 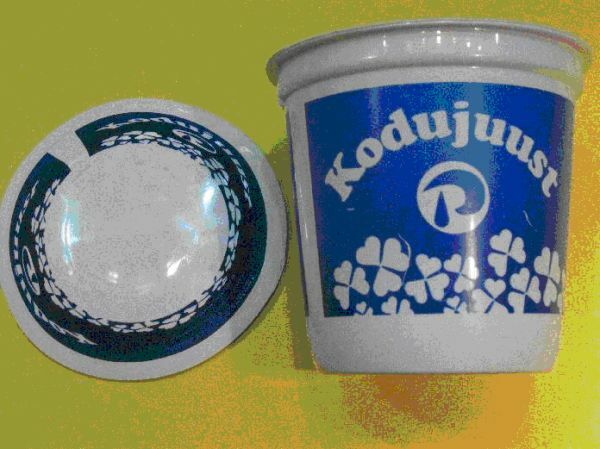 The curd cheese cup at the right recovers its original flat disk shape (to the left) after heating at 140°C.